Reduce inflationary pressure by reducing the growth of aggregate demand (AD) in the economy. Improve government finances (reduce the budget deficit) by increasing tax revenue and reducing government spending. 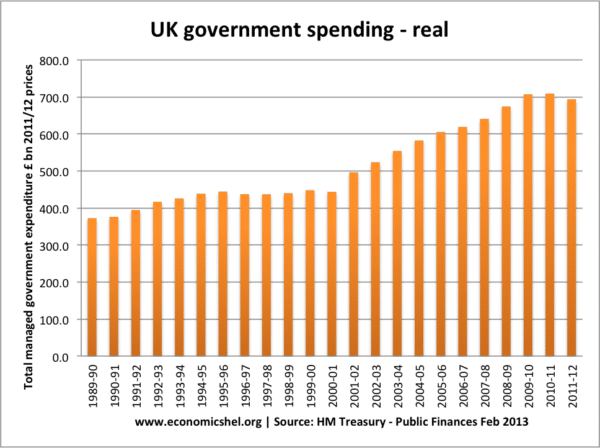 Cutting government spending may lead to under provision of public goods and public services. This can also have political costs. Also, a period of low public sector investment can cause problems for the long-term performance of the economy and reduce the long-run trend rate of growth. Improvement in government fiscal position may help reduce bond yields on government debt, which can have beneficial effects for long term investment. However, other economists argue in a liquidity trap, bond yields tend to fall – even if government debt rises. Time lags. One difficulty with implementing fiscal policy is the time lags involved. Time lags include 1) time take to change tax rates/spending plans 2) Time taken for these decisions to come into effect 3) Time taken for the cuts in spending to filter through into the economy. Fiscal policy could be tightened when the economy is growing quickly and in danger of overheating (e.g. if economic growth is above the long run trend rate of growth). Higher income tax reduces disposable income and therefore reduces consumer spending – this will moderate the rate of economic growth. However, in practice, we tend to see monetary policy used to reduce the rate of inflation. Higher interest rates increase the cost of borrowing and reduce rates of consumption. Increasing taxes to reduce inflation is politically difficult. Interest rates set by an independent Central Bank do not have the same political costs. 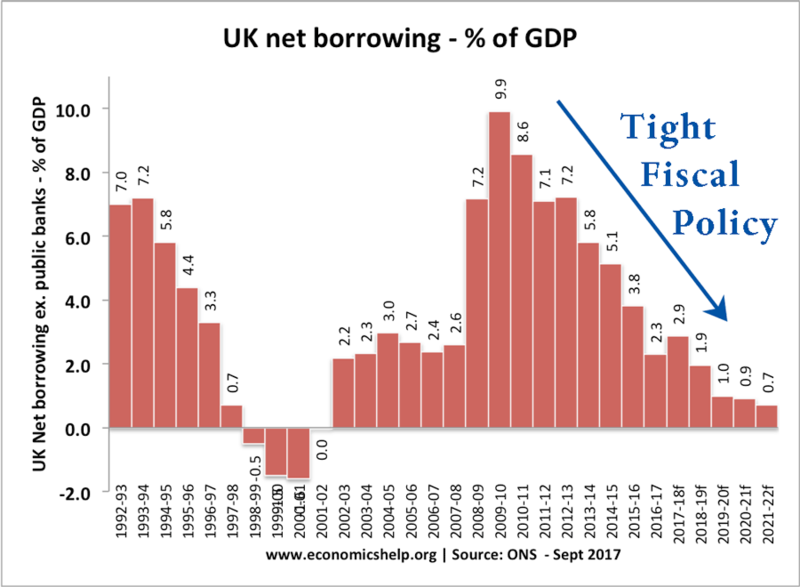 Tight fiscal policy is more likely to be implemented if government finances are poor and there are fears over the size of government debt. Yet, government finances are often deteriorating due to poor economic growth – exactly when tight fiscal policy is not appropriate in terms of economic growth. in 2010/11, the UK coalition government felt obliged to tighten fiscal policy; this involved higher tax rates (VAT) and spending cuts. The motive for tightening of fiscal policy was the deterioration in public finances which occurred after recession of 2008/09. 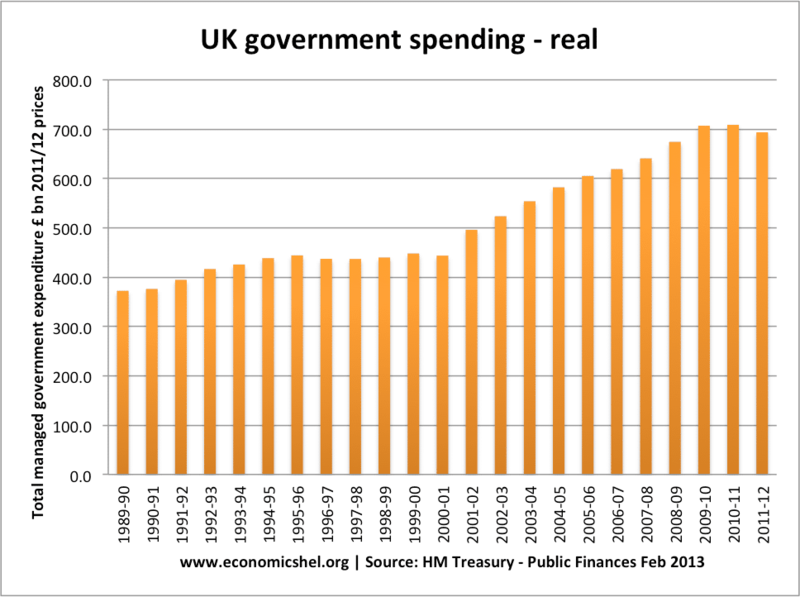 In 2011, we saw a small but significant cut in real spending. The cut in real spending occurred despite increased cyclical spending on recession-related benefits. Public sector investment and some departments saw bigger falls. 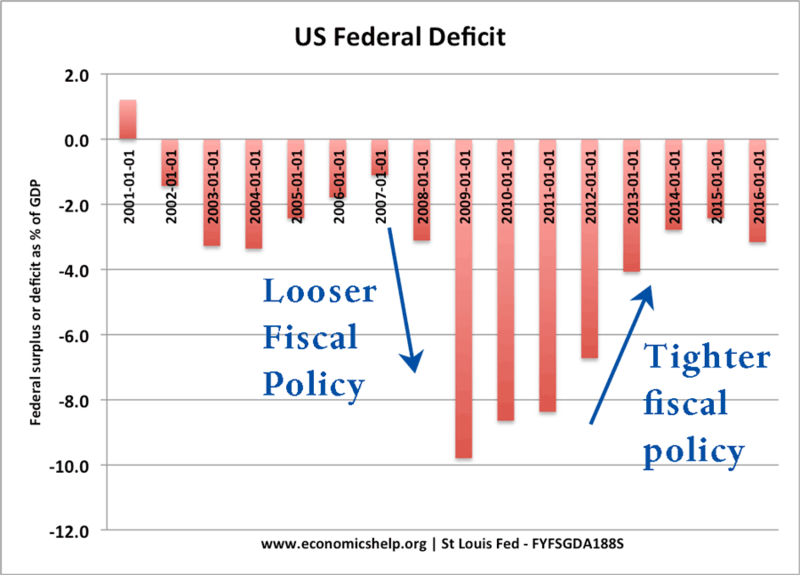 The government’s fiscal stance was controversial because, in 2010, economic recovery was weak. 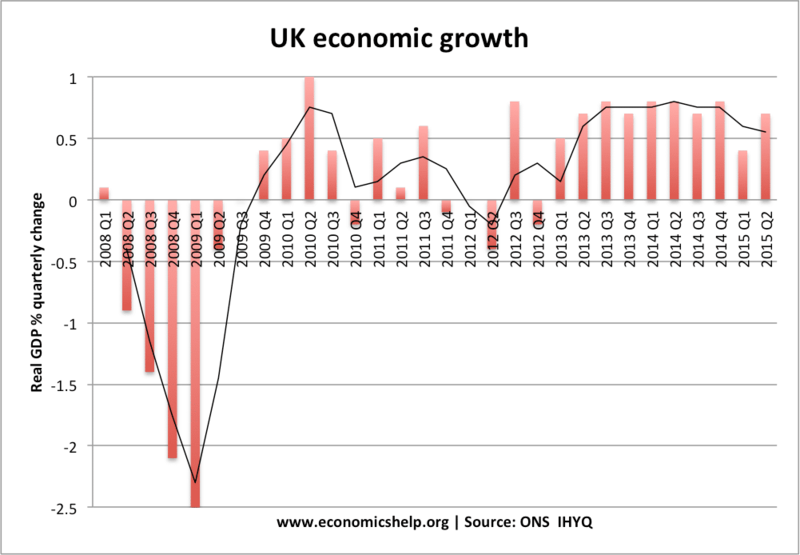 The tightening of fiscal policy in 2010, contributed to another economic slowdown in 2011/12. The problem with this second economic slowdown is that it leads to disappointing tax revenues. Low economic growth leads to lower tax receipts (lower income tax, lower VAT). The budget deficit fell at a slower rate than the government predicted, which led to a prolonged period of austerity. Many economists argued that with the economy growing slowly – it was the wrong time to tighten fiscal policy. It would have been better to focus on increasing the rate of economic growth and reduce the budget deficit later – when the economy was in a stronger position. What determines the success of fiscal tightening? What else is happening in the economy? 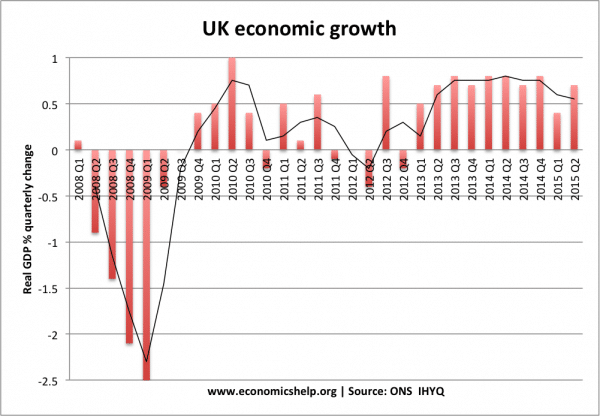 In 2010, the UK economy was weak, global growth was low. Also, interest rates were already close to zero. This meant that fiscal tightening could not be offset by a loosening of monetary policy. By comparison, in the 1990s, Canada successfully reduced its federal deficit – without causing lower economic growth. In the 1990s, Canada increased taxes and cut government spending but, at the same time it cut interest rates and saw a devaluation in the Canadian Dollar. This enabled the economy to continue to grow – despite the effect of tight fiscal policy on demand. Automatic stabilisers vs Discretionary stabilisers. If the economy grows – then automatic stabilisers will lead to improved tax revenues and lower government spending. The US saw an improvement in its budget deficit from 2010-17 because the economy was growing fairly consistently. In the case of the US, there wasn’t a need for austerity, but it was higher growth that enabled the improvement in public sector finances. The tightening of US fiscal policy – mostly achieved by higher rates of economic growth.